The Mahoning Valley Burger Review Board (MVBRB) took a leap to Austintown to try the burgers at Jeremiah Bullfrog’s Sports Bar & Grille. Bullfrogs is a sports bar where everyone is welcome. Whether you are 2 or 102, there is something on the menu you will enjoy and a fun sports atmosphere that will not discriminate. While the hostess led us to our table we noticed the different pieces of sports memorabilia throughout the restaurant, from signed photos and jerseys on the walls to the many different helmets sitting around the rooms. And everywhere you look, there is a large flat screen TV so the wildest of fans will not miss any play from their favorite team. JT scanned the rooms and noticed former Steeler Rocky Bleier’s jersey and signaled his approval. Looking around the eatery the waitresses were all friendly and happy to make your dining experience as pleasurable as possible. Our waitress, Deanna Campbell, made us feel at home with her happy-go-lucky attitude and friendly smile. We flipped through the menu, finding an entire section of appetizers, as well as pasta, chicken, seafood, sandwiches and salads to satisfy your palate. We found the burger section, and were pleased with the selection of 1/2 pound burgers on the regular menu, all served on a grilled sesame seed bun: Jeremiah’s Cheeseburger (Lettuce, Tomato, Onion and your choice of American, cheddar, Swiss or mozzarella cheese), Jeremiah’s hamburger (L, T, O), Big Bacon Cheeseburger (applewood bacon, cheddar cheese, L, T, O), Five-Two Bullfrog Burger (L, T, mushrooms, Swiss cheese), Buckeye Bleu Bacon Cheeseburger (applewood bacon, crumbled bleu cheese, L, T, O), and the Big Boy (pulled pork, cole slaw, tomato). additional mouthwatering selections: California Burger (avocado, crumbled bleu cheese, red onions), Dog Gone Burger (hot dog, cheddar cheese, L, T, O), Cincinnati Rose (chili, cheddar cheese, onions), How You Doin? (hot sausage, pepperoni, meatballs, hot peppers, mozzarella cheese, spaghetti sauce), 911 Burger (fried cheese, bacon, L, T, fry sauce) and a feast called the King Frog (2 half-pound patties, fried cheese, fried bologna, bacon, L, T, O). That’s a lot of great burgers, so we made our decisions and settled in for our meals. 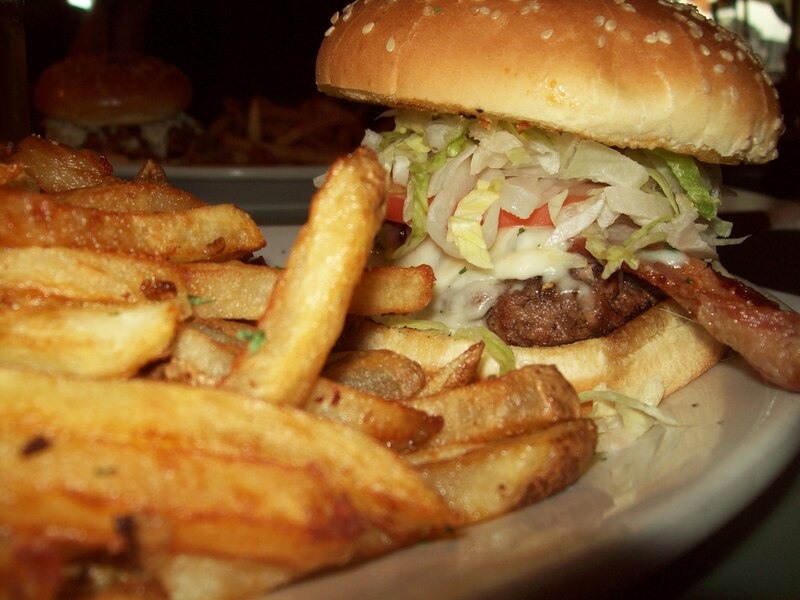 All the burgers have the choice of fries, or a salad, for a side. 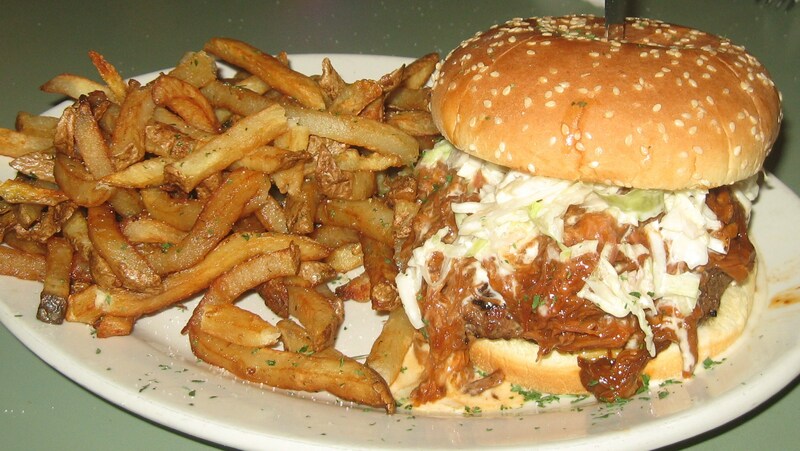 Scott noted the mountain of thick-cut fries accompanying the already large burger. 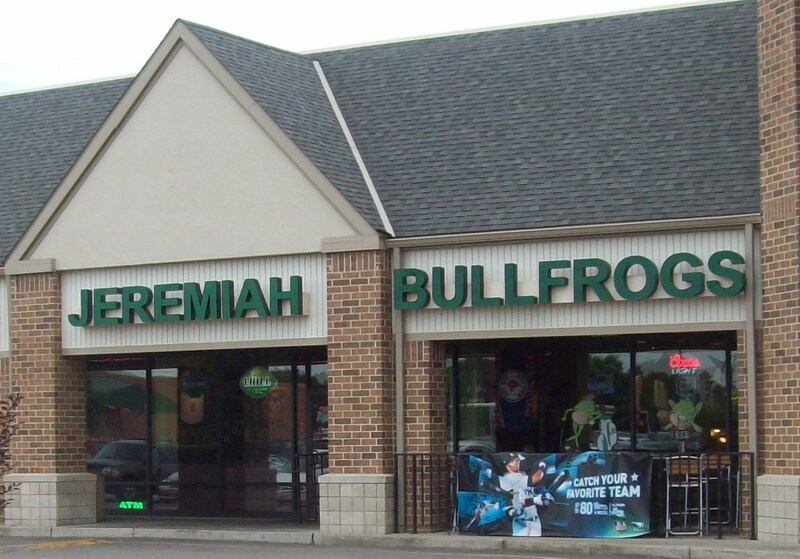 If you are looking for a great place to watch the game with the entire family, then hop on over to Jeremiah Bullfrog’s and order any one of their enticing burgers. Friend us on Facebook (Hamburger Review Board) to keep up with all the latest burger news and keep sending your burger suggestions to mvbrb@hotmail.com.